The Treasury Department needs to build more search functionality into its online government spending database and do a better job highlighting what data might be inaccurate, according to a congressional watchdog. The department must do more to secure the site and comply with federal open data policies, the Government Accountability Office said in a report published last Thursday. Treasury is mandated by Congress to report quarterly agency expenditures on USASpending.gov, which offers the public a detailed breakdown of the more than $4 trillion the government spends every year. While publishing spending data promotes government transparency and oversight, auditors found the site lacks a number of features that would give citizens greater insight into how taxpayer dollars are being spent. The site doesn’t provide structured, machine-readable metadata on agency contracts and obligations, going against recommendations from the Office of Management and Budget, the report said. 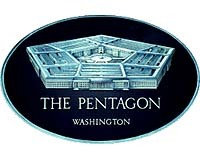 With the defense budget enhanced and set for fiscal 2019, contractors should “enjoy the moment,” Pentagon Comptroller David Norquist told an industry audience on Monday. In processing the newly augmented $700 billion spend that Congress delivered before the start of the fiscal year, many on his finance staff had no recollection, he said, of a time decades ago when the military wasn’t always coping with the uncertainty of multiple continuing resolutions and government shutdown threats. The federal government is primed to spend as much as $300 billion in the final quarter of fiscal 2018 as agencies rush to obligate money appropriated by Congress before Sept. 30 or return it to the Treasury Department. The spending spree is the product of the omnibus budget agreement signed six months late in March coupled with funding increases of $80 billion for defense and $63 billion for civilian agencies. The shortened time frame left procurement officials scrambling to find ways to spend the money. Through August, defense and civilian agencies obligated some $300 billion in contracts. But to spend all the money appropriated to them by Congress, they may have to obligate well over $200 billion more in the final quarter of fiscal 2018, which ends in two weeks. DataLab, a unit operated by the U.S. Treasury Department, recently undertook an analysis of ten years of federal contract spending data. The results are thought-provoking. Over the past decade, federal spending on contracts increased from fiscal year 2007 through 2010, following the surge in federal funding related to the Recovery Act. As the Recovery Act tapered off in 2011, contract spending began to decrease, which accelerated following sequestration in 2013. 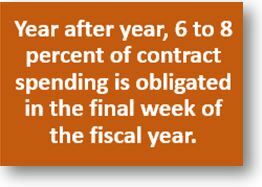 By 2015, contract spending had fallen 27 percent from its 2010 peak, before rebounding slightly in the following years. Seasonal trends in contract spending occur within each year. Spending tends also rise and fall on a monthly cadence, with roughly one small peak and one small drop per month. During the last month of the federal fiscal year — September — contract spending spikes, especially one week prior to the end of the government’s fiscal year. End-of-year spikes consistently occurred across the decade, and generally followed the broad rise and fall of spending. 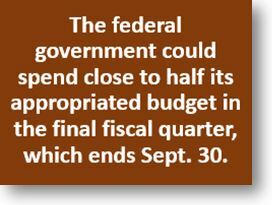 On average, September spikes accounted for between 6-8 percent of the annual spending in a fiscal year. USAspending.gov data captures two types of activity related to contracts: 1) the issuance of new contracts, and 2) modifications to existing contracts. Splitting spending on contracts into these two categories, DataLab found that spending on new contracts tended to spike in September. Modifications, however, displayed less variance and did not spike as drastically at the end of each fiscal year. This suggests that new contracts — not modifications—drove the spikes at the end of each fiscal year. USAspending data also captures what the government received from a contract (i.e., goods or services.) This categorization scheme, utilizing Product and Service Codes, contains almost 6,000 different categories, ranging from Dining Facility Maintenance to Buoys. For this analysis, DataLab collapsed these 6,000 categories into seven high-level groups. Notably, contracts classified as Facilities, Equipment, and Construction, displayed about 3.5 times the level of variance over the decade as total contract spending, and over 50 times the variance of spending on Weapons and Ammunition. Unlike the other categories, contracts for weapons ammunition did not spike at the end of the fiscal year. 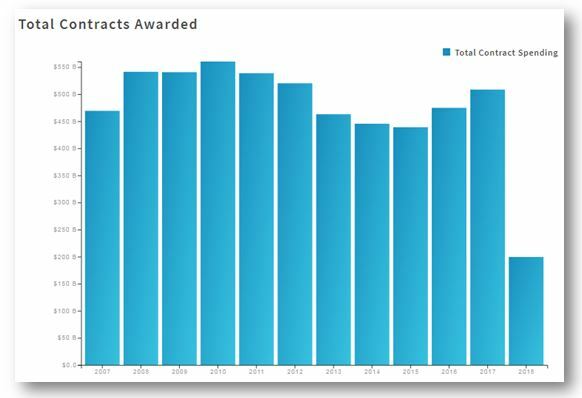 Continuing resolutions caused contract spending to spike in the same week, which was not observed for the passage of new appropriations. These findings cohere with qualitative research conducted by the Government Accountability Office (GAO), which noted in February 2018 that “some agency officials reported delaying contracts and application times for grants while under a [continuing resolution].” If agencies are unable to issue new contracts because adequate funds are not available under continuing resolutions, needs accumulate, and then are satisfied once funding is available. Notably, DataLab found that the passage of new appropriations resulted in a statistically significant decreases in total contracts and especially on professional services contract spending. This suggests that new appropriations allow the government to engage in longer-term budgeting, potentially facilitating forward-looking spending decisions. DataLab also noted that research and development spending was less variable and less impacted by continuing resolutions, suggesting that this type of service is likely to follow a distinct pattern for contract issuance from the typical cycles followed by other goods and services. As one of the smallest categories of spending, it is possible that this type of contract is partially sheltered from the timing of congressional appropriations. Other categories showed evidence of very large spikes in spending in response to congressional appropriations, such as transportation and logistic services. Further research as to why specific types of spending are more reactive to continuing resolutions would need to be done to explain why. Federal agencies tend to spend the most money on contractors the week after a continuing resolution and the week before the end of the fiscal year, according to the latest data set released by the Treasury Department’s Fiscal Service Data Lab. The team at the Data Lab are on a quest to make federal spending data more accessible, in terms of physical access to the data, as well as making it easier for people to understand. The first data sets and visualizations went live in April. The team released a new data set and analysis breaking down federal contract spending from 2007 to 2018.